Within the territory of the ancient Latium, the area, that is, between the Tiber to the North, the Lepini Mountains to the south, the sea to the west and the Preappenninici mountains to the east, the city of Palestrina, whose Latin name was Praeneste , occupies a strategic position of considerable importance: from the top of Mount Ginestro, at the top of which was the acropolis (the current Castel San Pietro Romano), surrounded by powerful walls, the city could control the valley of the Sacco, nodal point for the communications between Etruria and Campania, a region in which the Etruscans had rich settlements. But even one of the most important routes of communication between the Apennines and the Tyrrhenian was under Praeneste’s control, that is to say the path that, passing through the territory of Tivoli, emerged at Anzio. Between VII and VI century and until the middle of the 5th century B.C. Praeneste also has particularly intense relationships with the Italian world, specifically with the people of the Apennine hinterland and with the Piceno: this is demonstrated by the findings of some characteristic female ornaments, which are typical elements of the warrior’s armament, such as the bronze breastplates, imported from these areas or even produced in Palestrina on models coming from those areas. Tiberius owned a residence there, among which he recovered from a serious illness, so much so that in order to show his gratitude, he gave the city the status of municipality. Even the emperor Hadrian owned a villa, certainly identifiable with the remains of ancient structures that came to light below the modern cemetery. In the Constantinian age, Praeneste became a bishop’s seat and when, between 380 and 392, the edicts of Theodosius prohibited pagan cults, the veneration of Fortuna, as is obvious, was also decisively affected. And that this was still alive in 391 shows the tribute to the goddess harbored by the pagan Senator Simmaco. 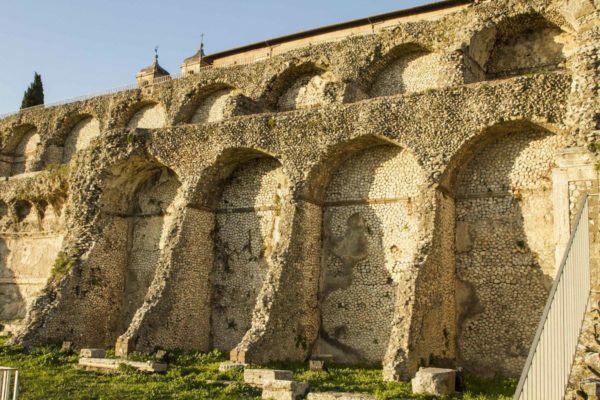 The sources for the history of the city in the Middle Ages are scarce, we know that it entered, with the donation of Sutri of 728, to become part of the Roman Duchy, and that, in 752 it was, for some time, occupied by the Longobards of Astolfo. The modern name “Palestrina” appears, for the first time, in a code of the Abbey of Farfa dating back to 873. Between 1347 and 1354 Palestrina remains a stronghold of the Colonna against Cola di Rienzo, hosting first the departure of the troops who attempted the siege to Porta S. Lorenzo, then being itself besieged by the tribune. Also in the fief Colonna, the city participates in the “Ghibelline” struggles against the papacy, which will lead it to suffer the so-called “third destruction”, in 1437, by cardinal Giovanni Vitelleschi, after the escape of Lorenzo Colonna. The Colonnas will be reinstated in their properties about ten years later, and will remain lords of the city until the seventeenth century, despite the temporary occupations by the Borgias (1503) and the Duke of Alba (1553). Meanwhile, in 1525, Pierluigi da Palestrina, father of polyphonic music, was born. 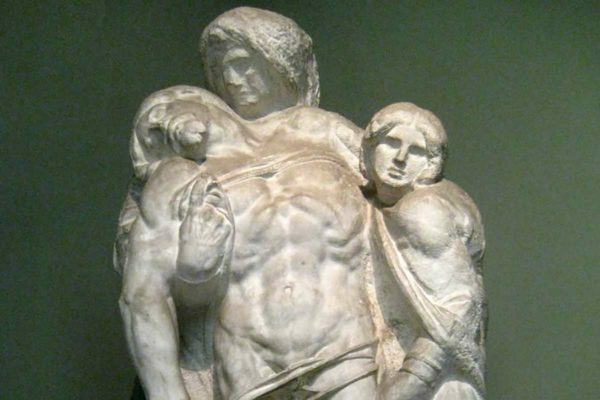 The recent history is marked by the bombings of the Second World War which, in addition to causing death and destruction, allowed, however, the discovery of the structures of the sanctuary, grandiose Hellenistic forms still partially visible today. Not far from Rome, northeast of Frascati, less than fifty kilometers away from the eternal city is Palestrina, a small town in Lazio of just over 20 thousand inhabitants. A town whose name, at first glance, says nothing but actually hides attractions of great interest. 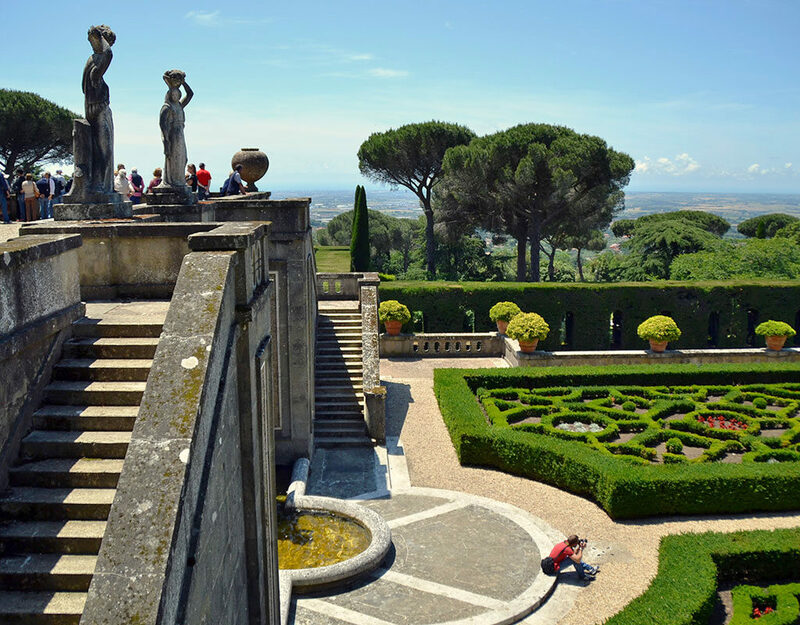 The proximity to Rome is a double-edged sword for Palestrina: on the one hand it could be dragged by the vortex of tourism, or attract the many travelers who come from all over the world even within its borders. On the other hand, all those who travel to Rome have so many beauties to admire, so much history to discover that they hardly decide to organize trips out of town. And it’s a shame because Palestrina is a little gem of Lazio that is worth visiting. Palazzo Colonna Barberini was built in the XI in the place where the Sanctuary of Fortuna Primigenia stood. However, what we see today is not the original building. In fact, in the fifteenth century it was demolished and rebuilt. Inside it houses the Museo Archeologico Prenestino. Another important monument is, as mentioned, the Sanctuary of Fortuna Primigenia, of which at the moment there are some sectors left. It is one of the most important testimonies of the late Republican age. Careful studies have confirmed that its origins, in fact, are attested to the II century a.C. 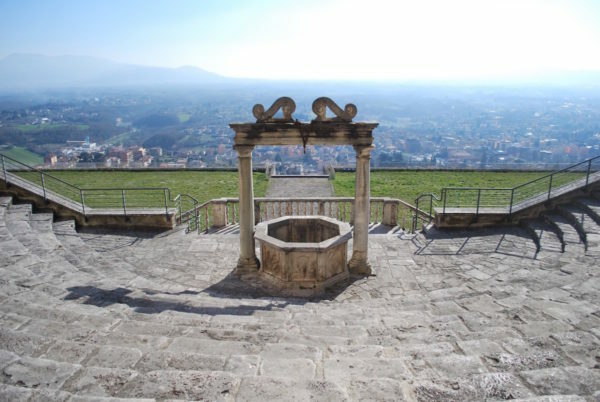 Together with the museum, this ancient monument is part of the museum system of Lazio. Among the religious buildings that enrich the historical heritage of Palestrina we can certainly mention the Basilica-Cathedral of St. Agapito martyr built between the seventh and eighth century and consecrated in 1117. The façade retains the Romanesque tympanum in its upper part, while the portal marble is from 1503. You can see traces of an ancient sundial from the Roman era. The interior consists of three naves divided by pillars with side chapels. The church houses significant works of art, including the depiction of the decapitation of St. Agapito by Carlo Saraceni in the terminal chapel of the right aisle, the crucifixion with Maria and San Lorenzo by Girolamo Siciolante da Sermoneta inside the Chapel of San Lorenzo and, a small wooden throne depicting the Savior, preserved in the Baptistery. Continuing the visit of Palestrina, we can admire the Church of Santa Rosalia located near Palazzo Colonna Barberini. This was built by Maffeo Barberini between 1656 and 1660. Another important place of worship is, without a doubt, the Church and the convent of San Francesco built in the fifteenth century. The construction of the church began in 1495 while its consecration dates back to 1504. 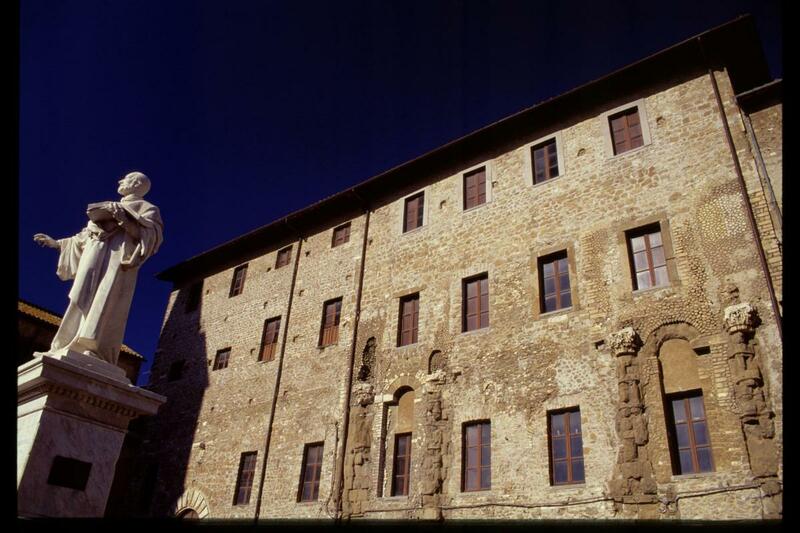 In the seventeenth century, by the will of Urbano VIII Barberini began the expansion and restoration of the complex. During the visit in the ancient heart of Palestrina, we will also meet the Church of Sant’Antonio Abate and the seventeenth century Carmelite convent. In addition, we can come across the austere and sober Church of Santa Croce and the Clarisse Monastery dating back to 1565 and consecrated in 1570. Finally, a visit deserves the Church of Santa Lucia, whose external appearance is simple, but hides rich inside and suggestive decorations. Thanks to its proximity to Rome, Palestrina is one of the most popular and popular tourist-cultural destinations. 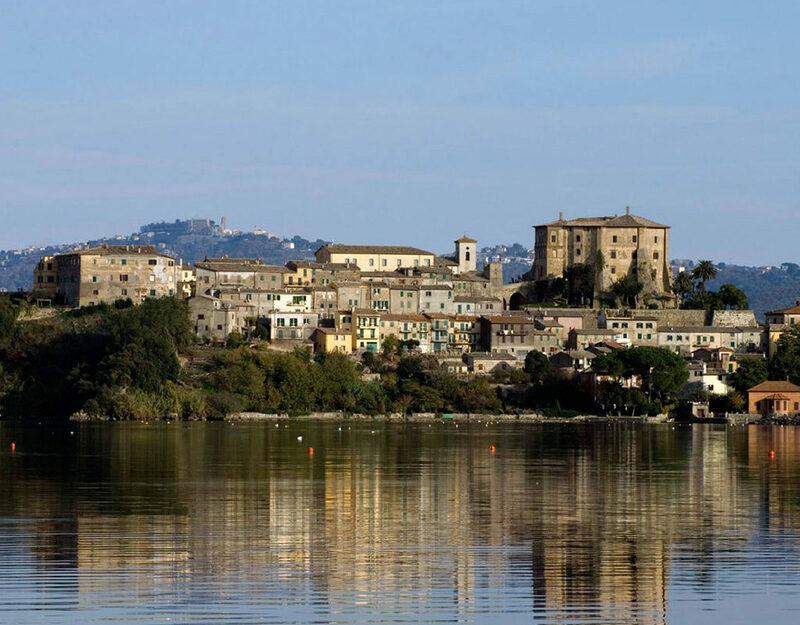 In addition, the valuable monuments located nearby, greatly increase the interest for this beautiful town in Lazio. 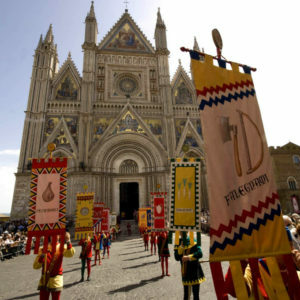 Orvieto, the city of treasures, is a destination for many tourists because it is halfway between Florence and Rome for centuries has stunned generations of visitors. 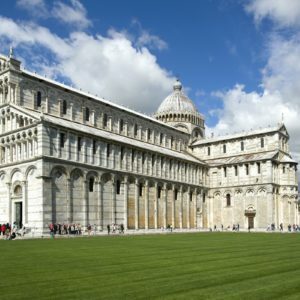 Ancient splendor of a maritime republic, today Pisa is no longer on the sea, but for a long time it has been an important port city and a center of traffic. 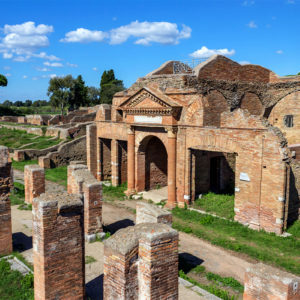 With the closeness with the Airport of Fiumicino Ostia Antica makes the ideal sight to visit even when you have few hour at disposal before to go back home. Is possible arrange a local lunch to enjoy the real taste of the Roman cuisine as Amatriciana or Carbonara as well delicious second meals of meat.